I have been talking with a lot of historians, librarians, archivists and curators about the possibility of using Kickstarter to fund digital humanities and digital library, archive, and museum projects. If you are unfamiliar, Kickstarter is a site and tool that anyone can use to fundraise for creative projects. In several of my conversations with humanists about Kickstarter I have heard back, “but isn’t Kickstarter a place for art projects, not for humanities projects”. The answer to that question is no. Kickstarter is a place for creative projects, specifically, discrete projects in which something is made. For folks on the DIY side of the digital humanities, an attitude frequently on display at events like THATCamp, this is not a problem. If you want to make things then Kickstarter is a great tool. Best of all, we don’t need to even think about what digital humanities projects on Kickstarter would look like. They are already there. I took the liberty of putting together a short list of projects that i think fit squarely in the areas that I have seen people at previous THATCamps working in. The Teaching Teachers to Teach Vonnegut project from the Kurt Vonnegut Memorial Library, raised 2,200$ to create and host a free workshop for Indiana high school teachers interested in incorporating the writings of Kurt Vonnegut in their curriculum. They even used as matching funds for a NEH grant. 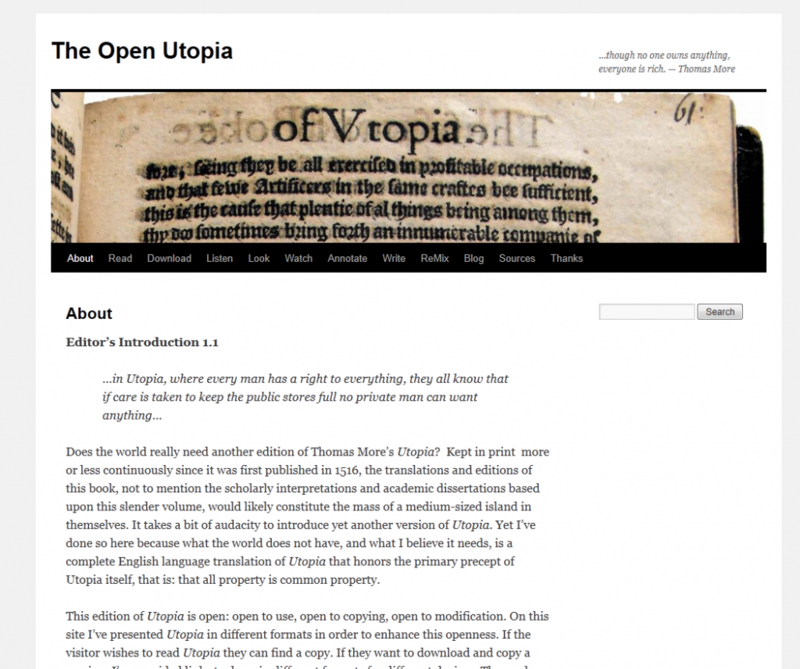 The Open Utopia: A New Kind of Old Book raised more than 4,000$ to create an open-source, open-access, multi-platform, web-based edition of Thomas More’s Utopia. </archive> raised more than 900$ to create an open archive of urban experience built from the street. Using unique QR code tags collaborators can make their personal experiences of the city accessible in physical space. Open Goldberg Variations – Setting Bach Free raised more than 20,000$ to create a new score and studio recording of J.S. Bach’s Goldberg Variations placed in the public domain. Kevin Ballestrini, a classics professor, has raised more than 2,000$ to create an educational card game. Smarthistory raised more than 11,000$ to create a slate of educational videos for it’s art history website. The moral of the story here is that Kickstarter is not something that could be useful for funding digital humanities projects, Kickstarter is already something that is useful for funding digital humanities projects. If you have project ideas that you want to share and workshop consider posting them in the comments for feedback from other digital humanists. Previous PostPrevious When did we become users?